Housing Minister Eoghan Murphy speaking ahead of his address to the ICSH AGM today. 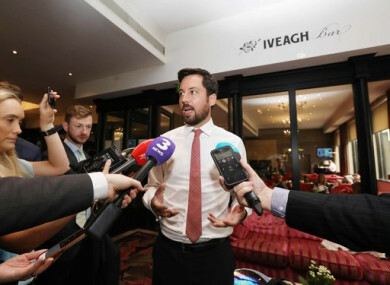 HOUSING MINISTER EOGHAN Murphy has criticised Sinn Féin after the party backed out of tabling a motion of no confidence in him. Murphy described Sinn Féin threatening the motion as an “unnecessary distraction” and “potentially reckless behaviour”, while speaking to reporters today. Last week, the party unveiled a new billboard which took aim at Murphy specifically for what it deemed his failure to get a handle on the housing and homelessness crisis in the year he’s been in office. “If you look at the billboard it was a list of things the minister hasn’t delivered on. It was the list of the increasing rates of child homelessness, pensioner homelessness, zero affordable homes, glacial delivery of social homes and increasing rents and house prices,” Sinn Féin housing spokesperson Eoin Ó Broin said last week. However, the party announced at their Ard Fheis over the weekend that they would not be presenting the motion before the summer recess. Aengus Ó Snodaigh said the party would use its one opportunity of Private Members’ Business before the summer to put down a motion on hospital waiting lists next week instead. Speaking to reporters today at the AGM of the Irish Council for Social Housing, Murphy said that Fine Gael’s focus was on “fixing the housing sector” and “getting thousands of homes built”. “[It's] an unnecessary distraction when you look at it. After what’s happened towards the end of the week. And potentially reckless behaviour,” he said. “Our focus as a government is on fixing the housing sector and getting thousands of homes built and that’s exactly what is happening. And we need to do that with the Oireachtas working with us to make sure that any legislation that comes forward our focus can be actually on measures that will help build homes and not on unnecessary distractions. Murphy said that the issue wasn’t about him, and that it was important instead to “focus on the work”. “I’m getting houses built and everything that we see in terms of supply indicators show that there are dramatic increases in housing supply happening,” he said. All of the data points to that. My job as minister is to drive that work and make sure that we get those houses completed and get people into those new homes. Last week, Murphy and the government came in for more criticism after the CSO revealed that the number of new houses built in 2017 was lower than was previously reported. The ICSH is the representative body for a large number of approved housing bodies (AHBs). It’s annual report for last year showed that one third (2,330 homes) of all social housing was provided by social housing charities last year. Meanwhile, over 28,000 tenancies from over 300 housing associations were registered with the RTB. The group took the opportunity of its AGM to call for a new national support scheme to assist older people moving to supported housing and not just nursing homes. Email “'An unnecessary distraction': Murphy criticises Sinn Féin over 'potentially reckless behaviour'”. Feedback on “'An unnecessary distraction': Murphy criticises Sinn Féin over 'potentially reckless behaviour'”.